Northern Peloponnese is an unknown destination for the majority of tourists. Yet, if you are taking the ferry from Italy to Greece, or if you are popping over from Zakynthos & Kefallonia islands to the mainland, you'll find yourself in the capital of this region, Patra. Northern Peloponnese is intertwined with mountain ranges that run all the way to the coast. Patra, Greece's third largest city and other little towns are lodged on the slopes of the mountains, with an amazing view of the strip of sea that divides Peloponnese from the mainland. 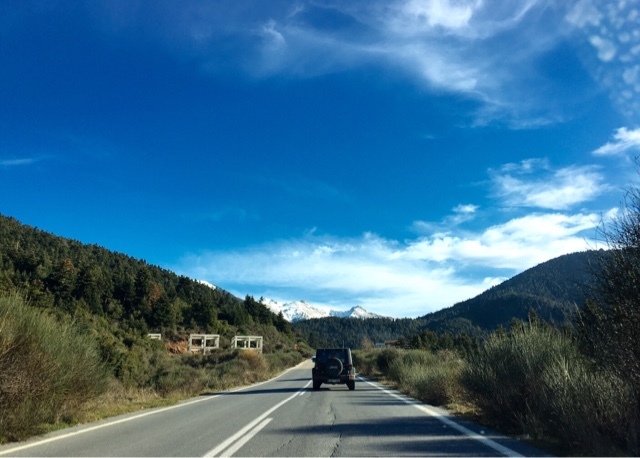 The drive from Patra to Athens is quite picturesque too; you have the sea to your left all along the way to Korinthos Canal and across the water you will spot favourite sea-side towns like Nafpaktos and Galaksidi, where most of us venture out for lunch on sunny Sundays; then, once you've crossed over the Korinthos Canal, the sea is on your right, dotted with islands, until you reach the outskirts of Athens. 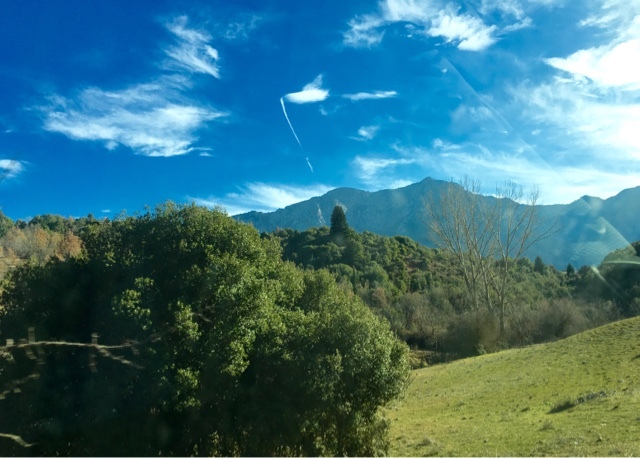 Here's a road trip idea, if you wish to be brave, hire a car and take a day or two to explore this mountainous region, complete with traditional villages, underground caves, ski resorts and natural springs. The main points en-route are: Patra - Kato Vlassia - Kalavryta - Kastria Cave Lakes - Planitero. 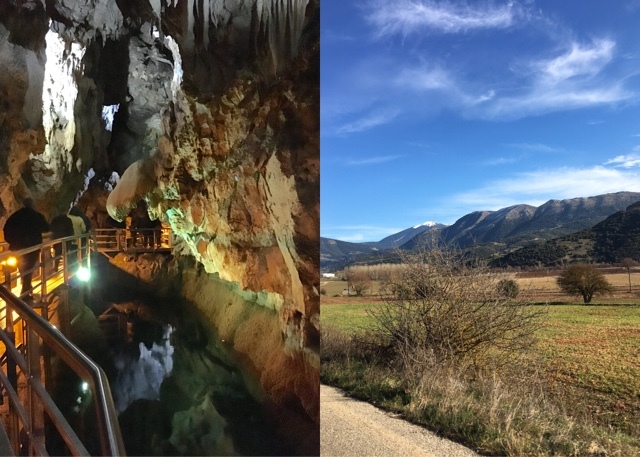 The road trip can also be done from Athens - Kalavryta- Kastria Cave Lakes - Planitero and leave Patra out altogether. We started on a sunny December morning from Patra. 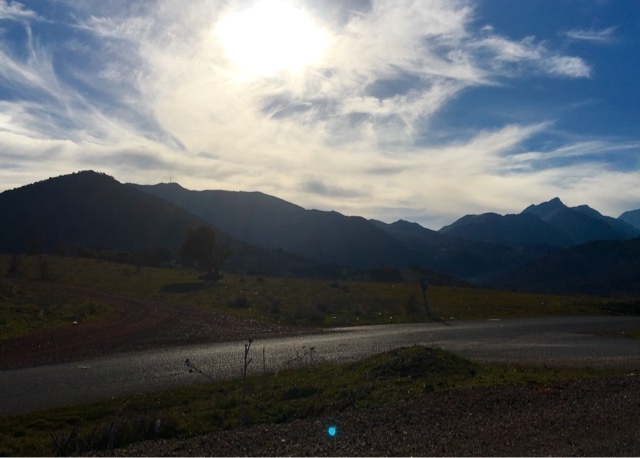 The road is uphill almost as soon as you leave the city centre; expect quite a few turns with deep drops all the way to Kalavryta. 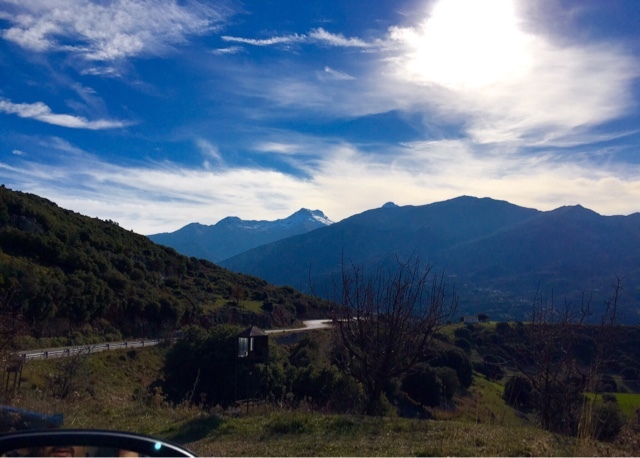 It's a gorgeous setting as you get to drive in-between mountain ranges and see the back of mount Erimanthos, which is always covered in snow and mount Panachaikos, Patra's mountain. 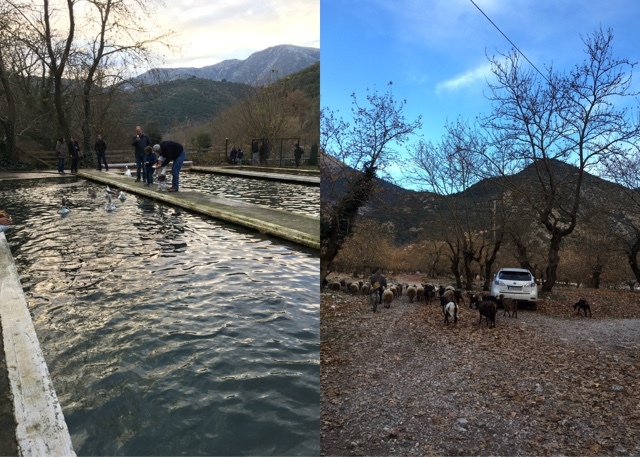 Unfortunately, there wasn't much snow on the mountain sides yet, but three days later, on 31 December we had to drive through snow-fall all the way to Athens. I'd advise to only travel during the day, simply because at points, there are no safety sidebars on the edge of the road and although the lanes are quite broad, it's better to stay safe and enjoy your trip. Another thing to remember is that there is no petrol station until you reach Kalavryta, at least I didn't spot any, so be prepared. 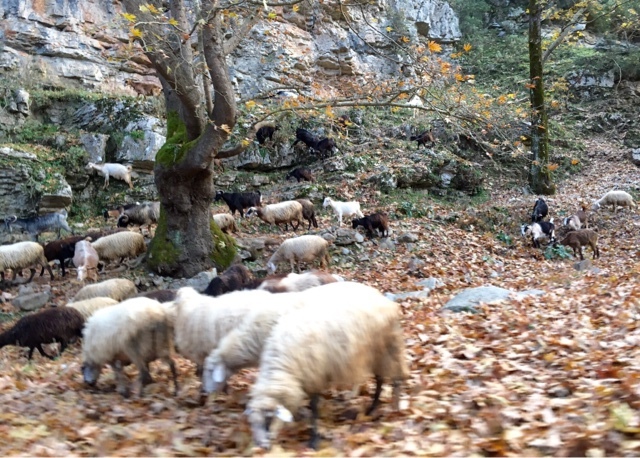 Around 20 minutes drive from Patra you'll reach Chalandritsa and another 15 minutes later Kato Vlassia; both are traditional Greek mountain villages, where most houses are made of stone and traditionally, residents used be shepherds and cheese makers. Sadly, they are more and more deserted as time goes by, but on weekends and summer days people flock back to spend time with their grandparents in the old family homes. These are popular weekend lunch spots for people from Patra too. Their local delicacies are home-made pies with greens and feta, goat broth and barbecued meats. Mountain staples. 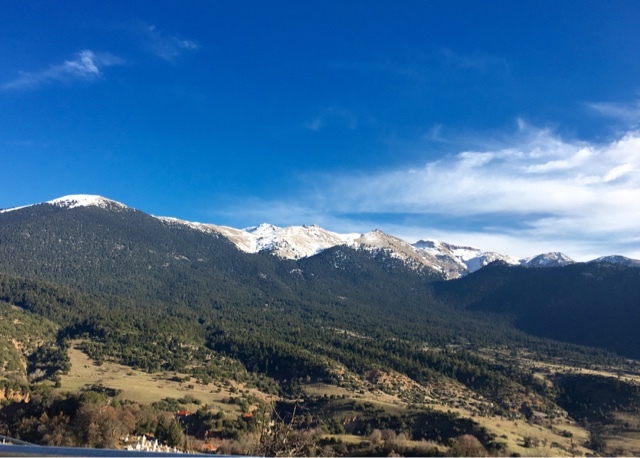 to Kalavryta you can spot Aristarchos telescope, right on the top of Helmos mountain. It's one of Europe's biggest telescopes. Its white dome can easily be missed amongst the snow background but on a sunny day it stands proud, with a capacity to cover a range of almost half of the known universe. It is supposed to be set up on one of the darkest spots in Europe. 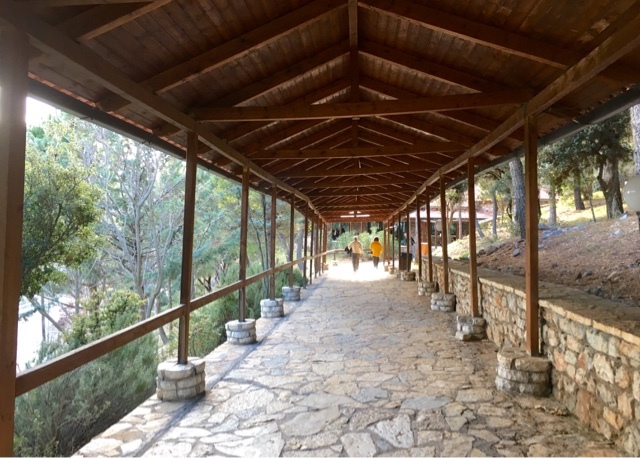 Just before you reach Kalavryta, there's also Agia Lavra monastery, a tranquil community lodged into Helmos mountain. It is open for visitors, while the sun is up. One of Greece's popular ski resorts. I'd suggest you spend a night here, to give yourself a break and explore the area without haste. A nice boutique hotel in the town centre is Kalavryta Canyon Hotel & Spa, with a very cosy open fire for those apres-ski chill out sessions! (check availability). If you want to put your history cap on, the area is loaded with incidents from the Greek Uprising in 1821 against the Turks and then the WWII resistance. Otherwise bring your stretchy pants along, because the restaurants around here are only a warm up to all of the pastry shops that follow! Traditional sweets are: galaktompouriko (milk, syrupy filo pie), kataifi, yogurt with local honey&walnuts and my favourite: loukoumades - fried, fluffy dough balls covered in syrup and cinnamon. Spot the "dinosaur head" stalactite? 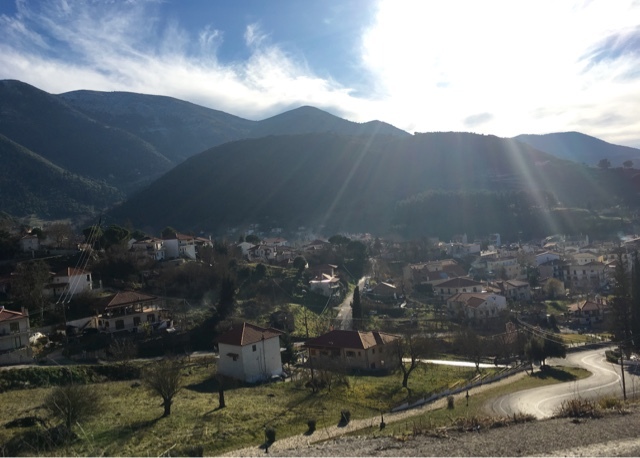 Driving past Kalavryta, you come to a crossroads: turn left for the Ski Centre and right for Lousoi village. After you've saddled Helmos mountain, the road drops on the other side to a high plain, crowned by mountain tops. 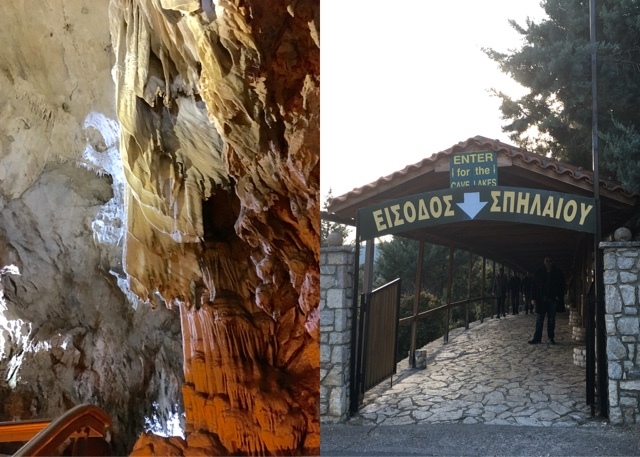 After Loussoi village, you'll spot the entrance to Kastria Lakes Cave. Entrance is only by guided tour, which lasts for 20 minutes roughly. The guides speak English and are open to all kinds of questions. The path in the cave is paved, but humidity is high so dress accordingly. 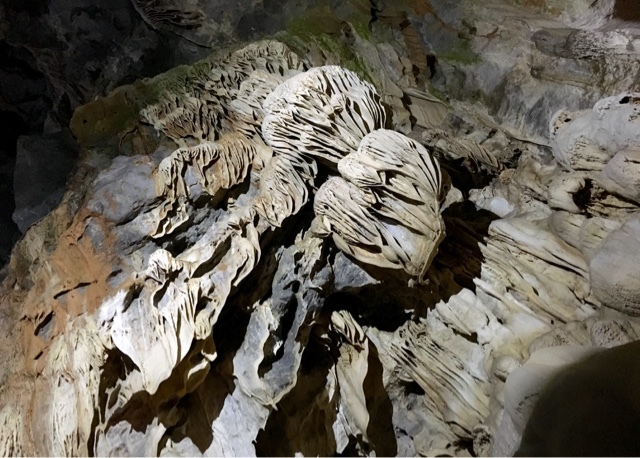 We were also told that depending on the time of the year it "rains" in the cave, so you might want to carry an umbrella around, especially in spring, when the snow melts on top of the mountain and water finds its way down to create this magic underground landscape. The tour takes you through the first 3 lakes, there are 13 lakes altogether, but the rest 10 are on a higher level not open to the public just yet. The caves were only opened to the public in the 1980's and there is still a lot of exploration to be done. The stalactites are superb, forming curtains cascading from the highest cave ceiling in the world apparently! There is a dinosaur head-looking stalactite too, which is quite menacing, even as you go close! You'll be in awe of nature every step of the way! 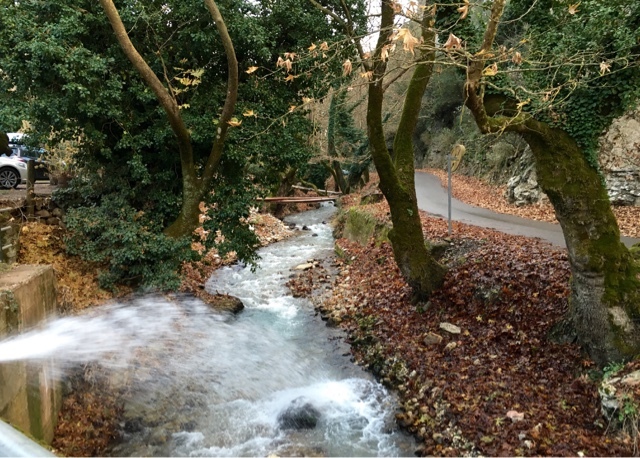 Planitero is an area full of water streams and big plane trees spreading their branches and roots everywhere. The water bubbles out of the rocks, under the plane roots, to form Aroanios river. It's such a gorgeous setting, you are surrounded by nature, greenery and snow-covered mountains. 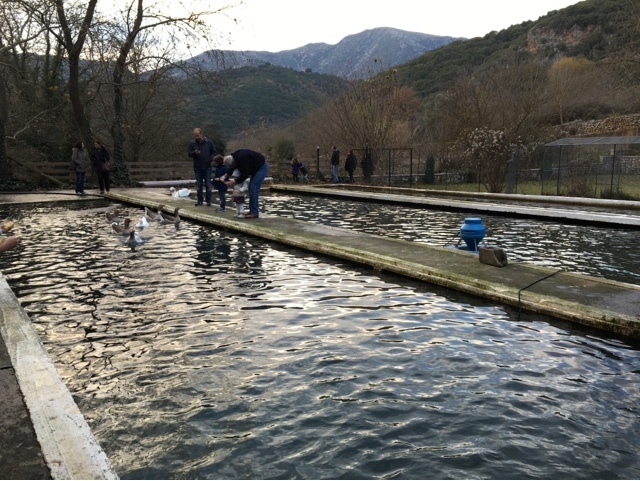 The stream waters are diverted at places, for trout farming. There are 3-4 farms, it's not a big place. You can catch your own trout if you fancy it, just make sure you don't fall into the water tanks! We sat at one of the farm restaurants for a late lunch. 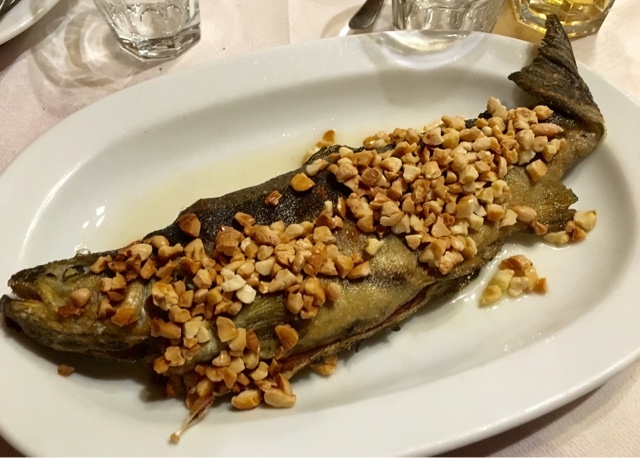 Trout is served in various ways: barbecued, fried, baked in parchment paper with lemon and olive oil and my favourite: fried with almonds and butter! There is also a more modern version of rigatoni with smoked trout in a red sauce, quite smoky and intense flavour! It's all very reasonable (7 euros per dish), simple and easy-going. Make sure you try anything with greens on the menu too, because the families running these restaurants hand-pick them from the surrounding mountain sides. 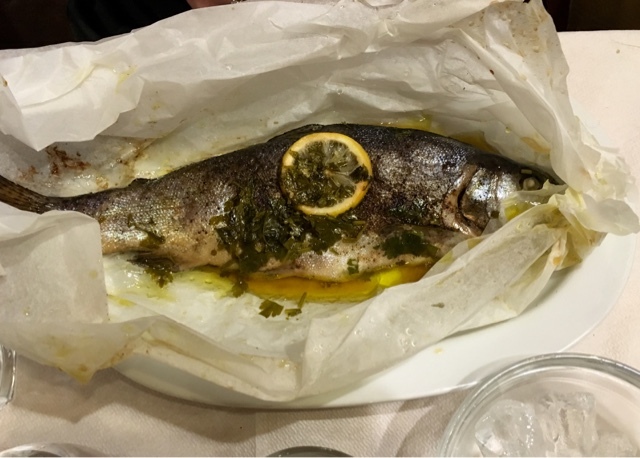 Try horta (boiled wild greens with olive oil and lemon) instead of a salad, or hortopitta (filo pie with wild greens). At the trout farms just take a moment to look around you, you are surrounded by snowed mountain tops, the sky is almost always clear blue, the stream waters provide the soundtrack and the trees seem to have always been there through the pass of time, they are massive! It's a little peaceful mountaintop oasis - breathe!